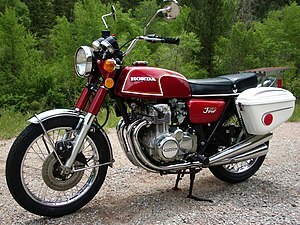 The CB Series is an extensive line of Honda motorcycles. Most CB models are road-going motorcycles for commuting and cruising. The smaller CB models are also popular for vintage motorcycle racing. All CB series motorcycles have inline engines. Note: The Honda CBR series are sport bikes. CB 750 "Four" 1969 to 1978 The model that set a new standard for "Superbikes"
* Note: unless otherwise stated the engine capacity in ccs can be derived from the number in the model reference. 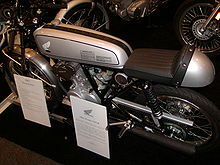 Wikimedia Commons has media related to Honda CB. ^ Shawn McDonald (September–October 2009). "Honda CB160 racing". Motorcycle Classics. Retrieved 2009-08-07. ^ Roland Brown (May–June 2007). "1958 Honda CB92 Benly". Motorcycle Classics. Retrieved 2009-08-12. This page was last edited on 23 February 2019, at 06:17 (UTC).